The amazing unobstructed ocean, park and city views from all of the windows and the two lanais in this condo on the top/penthouse floor make this an exceptional find in Waikiki! It sleeps six people comfortably. You'll love watching the sunsets and the Friday night fireworks (around 7:30 to 8:30) from here or just enjoying beverages while you look at the views! It is a corner unit, large (almost 700 square feet) and on the quiet side of the Luana Waikiki Hotel located on the famous Kalakaua Avenue. Beautifully updated in 2016 this condo has everything you need for a wonderful stay, including two new 55" inch LG Smart televisions (living room and bedroom). There is a washer/dryer in the unit and a full-size kitchen (dishwasher, microwave, large refrigerator, stove/oven). The kitchen is fully equipped, including a coffee maker, electric hot water kettle, blender, rice cooker, toaster, BBQ tools, pizza pan, and new dishes and cookware. The Hawaiian style living room furniture is new with a queen sofa bed and a desk. The two comfortable queen beds, six-drawer dresser and night stand in the bedroom are new. The Luana Waikiki Hotel at the Gateway to Waikiki. 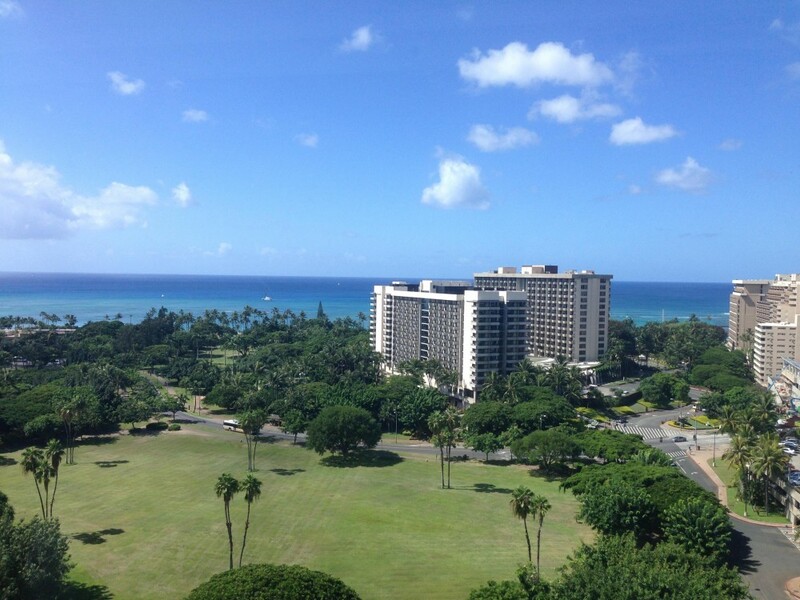 It overlooks the beautiful Ft. DeRussy Park and is an easy 10-15 minute walk from the beach. Our guests do not pay a resort fee. (See information below about luggage storage as it is not provided by the Luana Hotel for our guests). The hotel amenities include free WiFi; a saltwater heated pool with chaise lounges and cabanas; a state-of-the-art exercise gym overlooking the pool; community BBQ grills with seating; ATM; ice machine; and valet parking ($35/day). You don't need to rent a car! Exploring Waikiki from here without a car is convenient because it is easy to walk or take buses and taxis. There are two convenience stores and a gas station in the same block as the Luana. There are many excellent restaurants and shops very close by including the "Luxury Row" with Tiffany's, Chanel, Coach, Gucci, and Yves St. Laurent. Some of the restaurants located on Kalakaua Avenue are Duke's, Hula Grill Waikiki, Cheeseburger Waikiki, Top of Waikiki, Japengo Waikiki, Lulu's Waikiki, Doraku, SKY Waikiki, Eggs 'n Things Beach Express, Sansei Seafood and Sushi Bar, The Cheesecake Factory, P.F. Changs, Tony Roma, Subway, McDonald's and Burger King. The famous Wailana Cafe (open 24 hours) is just around the corner on Ala Moana Blvd. There is rental car information below if you want to rent a car during your stay. All of the major car rental companies are also located at the Honolulu Airport. Many visitors wish to visit Pearl Harbor but don't want to rent a car. It's possible to go there by city bus. There are also a lot of tours available, including transportation from and to the Luana Hotel. The concierge is available to help you. The owners met in Honolulu and fell in love when Rhonda was living in a building across the park from the condo. Steve introduced Rhonda to the Luana as he's stayed there many times on business trips. The hula girl in their photo will greet you as you enter the Luana. Paradise Transport & Luggage Services. The company also provides affordable shuttle service for private groups from and to the Honolulu Airport.